Originally from London, England, Cameron Sinclair, Chief Eternal Optimist, for “Architecture for Humanity,” attended Woodrow Wilson Elementary school in my hometown of Westfield, NJ for two years in the 1980’s. Cameron has grown up to show that altruism and hard work pay off, by seeking architectural solutions to humanitarian crises by bringing professional design services to communities in need. As of 2003, primary school was made mandatory and free of charge to all schoolchildren in Kenya. After the 8th grade, however, there is a limited number of high schools and qualified teachers, and unlike the primary schools, the secondary schools charge a fee, making it difficult for the parents to afford. North of Nairobi, in the remote mountain region know as the Aberdare Mountains, there was no high school at all, until “The Nobelity Project” and “Architecture for Humanity” came along. Turk Pipkin, founder of “The Nobelity Project,” an education and action non-profit which seeks to find solutions to many pressing global problems, advocates for the basic rights for children worldwide. Turk had an idea to build a rain-catching basketball court with a roof, water storage tanks and solar powered purification, which won an international design competition known as the Nike Gamechangers Award, that links sports with social change. 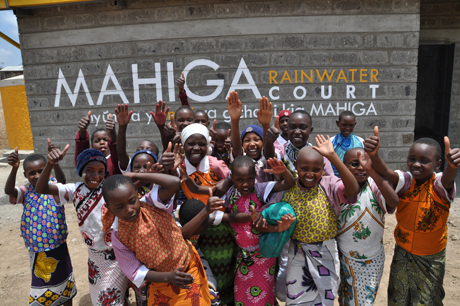 It was then that he teamed up with “Architecture for Humanity” to create the area’s first high school, Mahiga Hope High School, fully equipped with a computer and science lab, and eight classrooms for 350 children. Special appearances from Lyle Lovett, Willie Nelson, Barack Obama’s sister, Auma Obama, and Desmond Tutu. “Force of Nature, The David Suzuki Story,” is an important documentary about nature and the environment, that will be showing at Cinema Village, located at 22 East 12th Street, NYC beginning on Dec 2nd, 2011. Dr. David Suzuki is an iconic Canadian scientist, educator, broadcaster and activist referred to as the godfather of the environmental movement. In the documentary, “Force of Nature,” he delivers his last lecture, which he refers to as ”a distillation of my life and thoughts, my legacy, and what I want to say before I die.” This film makes a nice adjunct to The Island President. Aside from the interview above, you really must watch, “FORCE OF NATURE,” and learn what Dr. David Suzuki has spent his entire life studying. He goes further in depth to discuss the economic meltdown of 2008, capitalism and it’s significance in relation to nature, climate change, our forests, argon in the air, the extinction of 50,000 species, the depletion of fish, the biosphere and the challenge of making things right and living within harmony and balance. Meet the President of the Maldives, President Mohamed Nasheed, or “The Island President,” in a new documentary directed by Jon Shenk, which was recently acquired by Samuel Goldwyn. The Maldives, or Republic of Maldives, is an island nation made up of 1,192 islands and 26 atolls. It is approximately 430 miles off the coast of India and Sri Lanka, and faces a severe risk of being submerged by rising ocean waters as a result of climate change. The jovial President Mohamed Nasheed goes as far as donning his scuba geer and hosting an international board meeting underwater in order to get the point across that the entire island nation faces extinction by the end of the century if nothing is done to reduce emissions and CO2 as soon as possible. The legendary Joe Frazier was scheduled to make an appearance at the DOC NYC premiere of “JOE FRAZIER: WHEN THE SMOKE CLEARS” last night, but instead, it was one of the saddest days in boxing history. The film, directed by Mike Todd, reaches deep into the heart, soul and roots of the real man, and not just the boxing heavyweight champion from the ring. Joe Frazier was true to his family, and always returned to his hometown of Beufort, SC. He never had any negative thoughts, was motivated, unstoppable, wanted a better life for him and his family, and set out to do what he put his mind to. Fighting “his way,” Joe Frazier went on to compete against Muhammad Ali on March 8, 1971 and the third and final match between the two, known as the “Thrilla in Manila,” on Oct 1, 1975. These matches were ranked as some of the best and most watched fights in boxing history. But aside from being a champion in the ring, Joe wanted to give something back to the community and opened the Joe Frazier gym in Philadelphia, PA. “God made us all one, and we need to look out for each other.” Most of us need love and someone there to say, “you can do it,” so he created a place where an inner city child could go to stay out of trouble. See the documentary, “JOE FRAZIER: WHEN THE SMOKE CLEARS,” and pay homage to an icon. An encore screening of “JOE FRAZIER: WHEN THE SMOKE CLEARS” is scheduled to show at IFC on THURSDAY, NOV 10th @ 1:00pm and 8:15pm with the Director, Mike Todd in person! You are currently viewing the archives for November, 2011 at One World Cinema.